OFFOFFOFF.com Dec. 2002 Article "Roasted Chestnut"
For many of us, watching It's a Wonderful Life is like slipping into a favorite pair of flannel pajamas—they may show signs of age, but they're warm, cozy, and familiar enough to ward off even the coldest winter night. In It's a Wonderful (One Man Show) Life!, a solo reinvention of the classic Frank Capra film, actor and impressionist Jason Grossman takes us on a whirlwind tour of one of the most ubiquitous tales in the Christmas canon. As the title suggests, Grossman inserts himself directly into the center of George Bailey's story, condensing it into an hourlong parade of characters. Although this breathless retelling will likely be confusing to those unfamiliar with the movie, It's a Wonderful Life devotees (myself included) will be charmed by the show's mix of kitsch, nostalgia, novelty, and heart. Director Sharon Fogarty adapted the text for the stage, and she manages to hit the film's high points without any overly noticeable gaps. We still root for George, an everyman who is desperate for adventure but, through circumstances beyond his control, never manages to leave his hometown of Bedford Falls, a lovable symbol of Middle America. Instead, he takes over his father's bank, marries a local girl, and starts a family. When catastrophe hits the bank, George finds himself contemplating suicide. Thankfully, fate intervenes in the form of an eccentric angel named Clarence, who gives George a golden opportunity—the chance to see what the world would be like if he had never been born. Fogarty's script deftly captures the arc of George's character, illustrating his drive, goodness, frustration, and joy. 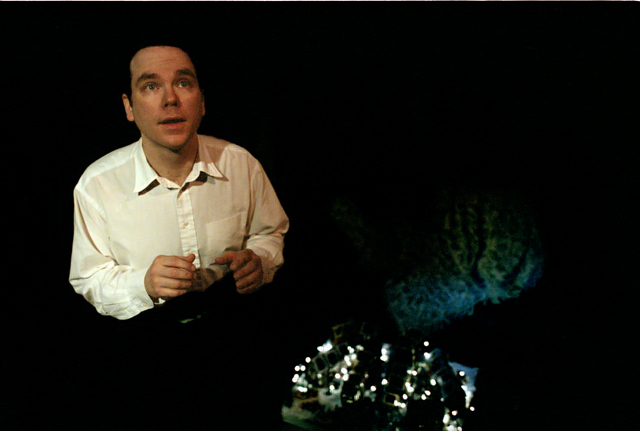 Her direction capitalizes on the minimal set—for example, a miniature winter village strung with lights serves as Bedford Falls, while the table it sits on splits into two to suggest the famous scene where George, his future wife Mary, and others fall into a swimming pool underneath a dance floor. The narrative becomes a bit muddy in its execution, however. In some scenes, Fogarty has written dialogue for Grossman to communicate as multiple characters; in others, Grossman portrays George alone as he participates in and reacts to the dialogue around him. The latter scenes are often successful—it is fascinating, for example, to focus on George as he learns of his father's wishes for him to stay home and run the bank. Watching the film, we aren't allowed to linger so long on George's reactions. However, this luxury also requires us to fill in the missing dialogue. While George's responses often make the missing words obvious, the motivations are frequently unclear. 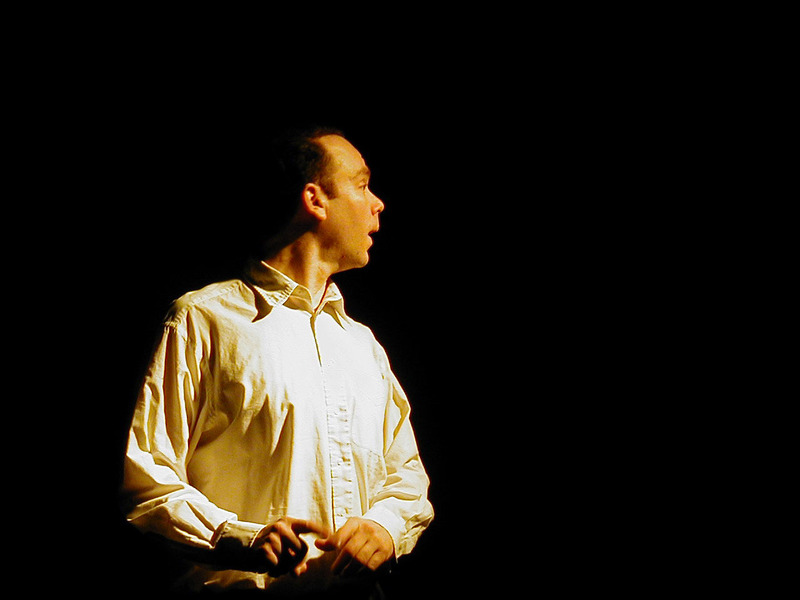 In many of the scenes in which he voices multiple characters, Grossman succeeds in one of the greatest challenges in a one-man show—creating dramatic tension and energy with yourself. The scenes between Clarence and George are especially quick-witted, although a caricature of the evil Mr. Potter, while convincing, takes just a moment too long to assume. Still, playing more than 33 characters is no easy feat, and Grossman is undoubtedly one of the hardest-working actors in New York right now. He is particularly effective in his earnest take on Bailey, managing to invoke Jimmy Stewart while still making the lines his own. He also offers an impeccable comic turn as the slightly off-center Uncle Billy. His delivery is so personable and direct that often the effect is as if you were watching a close friend recite the show in his basement. While a few of the more kitschy elements made me wince (why place action figures inside a scaled-down bank? ), Fogarty's script and Grossman's performance are essentially faithful to the heartfelt tone of the film. Even as they tweak and embellish an old favorite, they offer a chance to hear the story in a new way, with payoff intact. And what a payoff it is. As George rediscovers (or discovers?) the pure, simple joy of being alive, I found myself fighting back the familiar tears I experience each year while watching the movie. That this pared-down show can create such resonance is a testament not only to Capra but also to the talented director and performer who bring his story to new life. While these flannel pajamas may be less familiar, they still manage to keep away the winter chill. But if you have to have something lighter, there’s another one-man show bound to please. At Manhattan Theatre Source, Jason Grossman performs the whole of It’s A Wonderful Life all on his own. The show premiered to good reviews in 2000 and has had multiple runs since; it’s no mean feat to shift from angel to suicidal sad sack to wide-eyed child as energetically and convincingly as Grossman does, especially considering the lack of spectacular sets or costumes. We haven’t met many people who’ve never seen the movie, but whether you have or not, It’s A Wonderful (One Man Show) Life will probably warm your heart (hopefully keeping you warm in your seat at the same time). "It's A Wonderful (One Man Show) Life!" Mr. Grossman, best known for his work as the Director/Creator of the Funny. . .Sheesh variety show, brings an amazing energy and love for the time honored classic as he unleashes an array of characters and accents for the adaptation of this Christmas Classic. From his sweet Zuzu Bailey to his crotchety Mr. Potter, there is a controlled intensity that gives you the unique sensation that you are watching a man who undeniably enjoys his work. Not only does he enjoy his work, but his performance is outstanding. Mr. Grossman's presence and adaptation of the piece provide an avenue for the audience that they are not merely watching the performance but part of it. Mixing humor and tears Mr. Grossman attacks the play with surgeon-like precision and succeeds where so many one-man shows fail: he builds a believable picture of George Bailey's life. Whether it is different characters talking to each other or Zuzu giving rose petals, he never left a character on long enough to become stale and always left the audience wanting to see more. Director Sharon Fogarty (Director of 'heaven') co-adapted the piece and provides a minimalist approach for the set design. The set was merely a couch, a model of Bedford Falls, and a spider hanging from the ceiling. Mr. Comstock's lights provided a necessary ambience to enhance the piece - although there were times where the lights seemed slightly misaimed - and help convey the journey of George Bailey's death and subsequent rebirth. Both help illuminate the shining talent on-stage without taking away or over powering the viewing experience. It's a rare time when we see someone as talented as Mr. Grossman not only play the role made famous by Jimmy Stewart, but executing it in such a manner that it's not a poor imitation or homage. Mr. Grossman makes the role unique to his own person. He drove the audience to tears of laughter as he played the part of George dancing and later to tears of sorrow as he recites George's richest man in town speech. this improved during the second half. Still, this is a fantastic play and any opportunity to watch the immensely talented Mr. Grossman or Ms. Fogarty should be utilized. Jason Grossman channels all the citizens of Bedford Falls in his solo interpretation of It's a Wonderful Life. Jason Grossman (no relation) has been a mainstay on the NYC sketch and improv scene for years, but don't expect a spoof here. While Grossman plays it straight in this heartwarming solo rendition of the Capra classic, single-handedly bringing all of Bedford Falls' residents to life, he mines plenty of human comedy from the timeless tale. Sometimes it's nice to turn off the cynicism. Jason Grossman's lively and inventive solo performance of Frank Capra's holiday classic premiered last year at the Horse Trade Studio Theater. Now, under Sharon Fogarty's direction, Grossman is back, morphing his way throught everyone in Bedford Falls, intimately exploring George Bailey's dreams, ruin and restoration. It's a Wonderful (One Man Show) Life! is precisely what the title suggests: a one-man adaptation of the classic Frank Capra film about a man who decides that the world might have been better off had he never been born, only to be proved wrong by an earnest apprentice angel named Clarence. Jason Grossman adapted the screenplay (by Frances Goodrich, Albert Hackett, Frank Capra, with assists from Dorothy Parker, Dalton Trumbo, and Clifford Odets); and he plays all the parts, using the voices of the original film actors (such as James Stewart, Donna Reed, and Lionel Barrymore). I saw this in its premiere last winter. Grossman is enormously skillful and as earnest as the film. This is a sweet-natured and very winning holiday entertainment. Those who love [the film] will enjoy themselves enormously at this show. Frank Capra's classic becomes a solo spectacle. Comic actor/impressionist and author Jason Grossman takes on Frank Capra's holiday classic, 'It's a Wonderful Life' -- as a one-man show. Based on the glorious black and white film (or colorized version, perhaps), this solo endeavor tells the endearing story of Clarence, a bumbling angel who must convince George Bailey that life is indeed worth living. Directed by Sharon Fogerty, this intimately staged version includes all of the film's familiar characters -- each played by Grossman who imitates the voices of the movie's stars including James Stewart, Donna Reed and Lionel Barrymore. Recommended for all ages. It's performance art meets the Ghost of Christmas past! Assuming you've seen the iconic film, this one-man show is a perfect warm up to the Christmas season. Wide-Eyed - Not every actor could so meticulously recreate the 24 lead characters from Frank Capra's classic with as much reverence and love. Then again, not every actor would try. It's no surprise that Jason Grossman, the man inhabiting these two dozen roles, describes himself as an "It's a Wonderful Life" fanatic. He is! And with only a few simple props, Grossman transports the rest of us to Bedford Falls and back again in just under an hour--passionately reproducing the wonder of it all, Jimmy Stewart included. Blind Side - But Grossman forgets to consider the uninformed viewer. His recreated movie scenes sometimes lack sense because they need further exposition. Rather than be confused, you'd be wise to see the movie first so you can fully enjoy his sentimental adaptation. There are fans, and there are FANS. Jason Grossman is the latter, and he's delightfully channeled his enthusiasm for "It's a Wonderful Life" by creating a stage production in which he single-handedly plays 24 characters. Impossible you say? Not so, says Karolyn Grimes, who saw the show last December in Seattle, calling it "imaginative" and "very funny." With minimal set and atmospheric lighting, Grossman creates almost every scene in Bedford Falls, morphing through everyone from Annie to Zuzu. 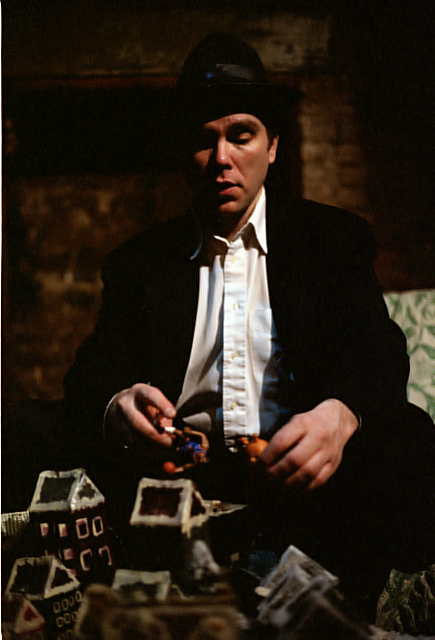 This December, he's doing it again, on Dec. 6 and 7 at Theatre4 of the Center House at Seattle Center (206-325-6500, http://www.ticketwindowonline.com) and Dec. 12-22 at Actors Playground, 412 Eighth Ave., New York City (212-206-1515, http://www.smarttix.com). General admission is $15, seniors, students and children $12. Jason Grossman flings himself into a whirlwind one-man performance of a certain holiday classic in "It's a Wonderful (One Man Show) Life." "It's a Wonderful (One Man Show) Life" gently reminds us that maybe, just maybe, the holidays aren't that bad after all. Merry Christmas, Mr. Potter! Jason Grossman nimbly performs this solo version of that most classic of classic holiday films. He does exactly what you think he's going to do. He gets up there all by his lonesome and tells you the story of one George Bailey. Have you seen this movie? It's the one starring Jimmy Stewart. You know, the Tom Hanks of yesteryear? (Or is it Edward Norton?) They always show it at Christmas time? If you haven't, you should. And then go see Mr. Grossman do all the characters in this wonderful one man show. The thing most striking about Jason's performance was not only the nicely done impressions of those oh-so-familiar characters, but the way he manages to imitate the emotion involved. For the bulk of the time he didn't really seem to be doing Jimmy, but rather, playing George like Jimmy would have with truth and conviction. His love for Mary and the kids, his upset at losing the $8,000 and his contempt for Mr. Potter were all very convincing from a shear acting standpoint. Sure, there were a few times where we got the standard Jimmy Stewart act, but they were well placed for comic relief. The rest of the characters were also well executed and the pacing and timing were terrific. Sharon Fogarty (adapter/director) does a nice job translating the film to stage. She figures that most of you have seen the dang thing, so she pretty much cuts to the chase. The sound choices were enjoyable and helped to push the story along without drawing too much attention. The lighting could have been better. There were a few too many dark spots, but that is more than likely a venue limitation as is the case in many venues about town. This show does an excellent job doing precisely what it is supposed to do it lifts your spirits in what can sometimes be a rather down season. It reminds you that you are important in this world and that you are more deeply loved by those who love you than you may ever know. Here is a show that Jason Grossman can put on every year for many, many years to come. It would be nice to see in the future a bit more of Jason's own personal humor and a few more surprises in presentation. Like when he eats his kids. That was funny. You'll understand when you see it. Which you should. It is much more fun than seeing it on TV again. We saw this charming show last year, and like the movie, could see it again and again. This solo performance by Jason Grossman is one of the season's most delightful. Playing in Victoria, B.C., and Seattle early in December, and then in New York City. Sharon Fogarty directs.